Three kids, riding on the bike lane from soccer practice, stopping at a crosswalk for a pedestrian and one motions for other riders to do the same. Cue the Whitney Houston song. ← Where are the PPW Safety Enhancements? 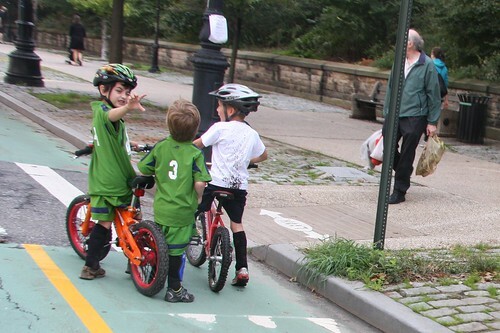 That kid’s like the Emperor, using the dark side of the force to stop other cyclists in their tracks. Eric, according to Louise Hainline’s emails her crusade against the bike lane was like fighting the “Death Star,” so your analogy is pretty good. Only maybe the kid saw Iris Weinshall double parking her car and tried to move it using the Force.